For both day-trips and longer ones, as well as work-parties, carpooling is often an option. For Salmon Ridge SnoPark (going out Mt. 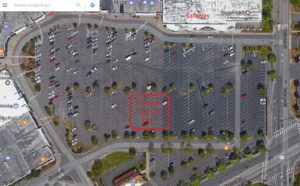 Baker Highway), the traditional meeting place is the Safeway parking lot off of E Sunset Dr. It’s often fairly crowded near Safeway, so plan on meeting closer to the Skagit Bank (see map below).